So began Twelfth Night, or, What You Will, one of the more popular comedies of William Shakespeare penned in "about 1600", according to General Editor Alfred Harbage in The Complete Works published by Penguin Books Inc. About 15 years ago, Douglas Abel uttered these words in the 99-Cent Theatre production of the play on the Keyano Recital Theatre stage, playing the dual roles of Duke Orsino and Director. The speech has stuck with me all those years and apart from a few misplaced words, I can recite it pretty much intact. I tested myself the other day as Dylan held my heavy volume of the Bard's works and followed along. The words are part of who I am, partly because I've recited them literally hundreds of times, and because of their meaning. Music: connected to feelings, rooted in love, the soundtrack of life. The world would be a sad and silent place without it. 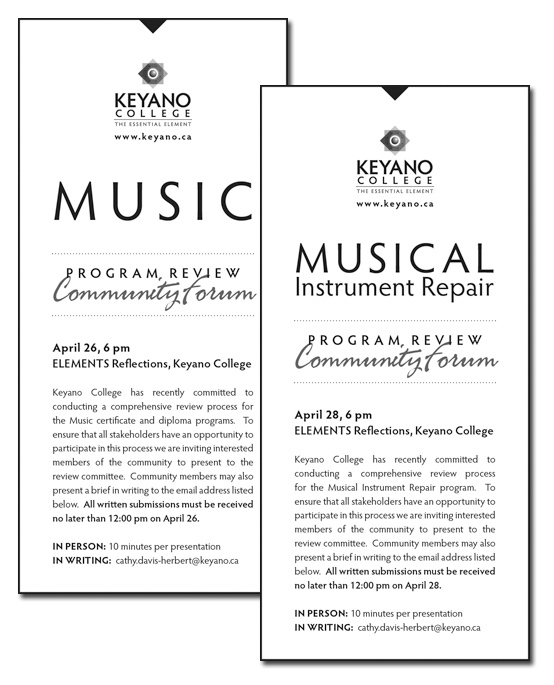 This coming week Keyano College is hosting a couple of public forums to spark an important dialogue about two important pieces of music in our community, the Music certificate and diploma programs and the Musical Instrument Repair program. The news of their suspensions sparked an outcry from across the region and country. High school students, alumni, and passionate community supporters raised their voices, sent emails, wrote letters and inspired the program review that is going to happen starting on Tuesday. It's an important process that allows musicians and music lovers the opportunity to articulate their passion and perspective on why these programs are important and perhaps how they should be changed or adjusted. Relevance is key, and this is a great forum to suggest ways in which the programs can evolve to meet the needs of our changing community and region. 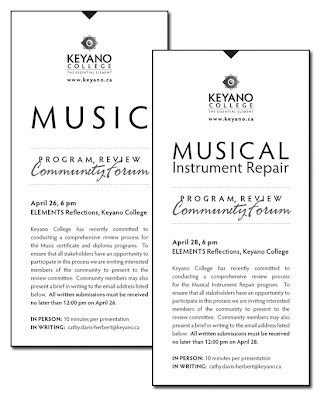 A number of years ago, Keyano Theatre started their Theatre Angels program as a mechanism for their fierce advocates to show their support through contributions to the Keyano College Foundation. That campaign raises thousands of dollars annually in support of this vital cultural cornerstone. The PLAY ON campaign strives to do the same for the Music and Musical Instrument Repair programs. If you were one of the hundreds of supporters who came out on April 7th as protest turned party, or if you are a successful alumni of these programs, the Foundation invites you to help. Funds raised through the PLAY ON program won't independently solve the fiscal issues, but they will send a strong message. To make a donation to the PLAY ON campaign click here. What does music mean to you? What does music mean to our community? Think of those songs, melodies, and riffs that take you back, raise the hairs on your neck, set your toes a-tapping, make your heart soar. I listen to "Tomorrow in Her Eyes" by Ron Sexsmith and my soul stirs with thoughts of my wife. As the first few bars of "Gonna Fly Now" by Bill Conti pop out of the iHome stereo I feel rejuvenated and inspired. When I listen to my favourite jazz album, Fearless by Mike Allen (the other one), it feels like home, familiar, safe, warm. We all have our songs, our melodies, our riffs. Music truly is the food of love. Play on.